Hello readers, I know you just want to read the post, but guess what...Grammarly is the new it thing for proofreading. I use Grammarly for proofreading so I don't you don't make silly mistakes like putting "the rapists", instead of "therapists." That would be awkward in an essay, now wouldn't it? Cover Love: I like it, but it could be better. It's cute and tells a tad of what the story is about however. 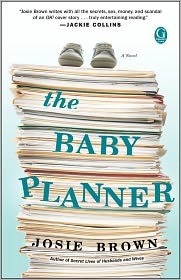 While helping a new client,Seth Harris, a high tech entrepreneur who must raise Sadie, his newborn daughter, as a single parent after the tragic death of his wife in childbirth maneuver the bittersweet journey from mourning husband and reticent father to loving dad, Katie's own ideals about love, marriage, and motherhood are put to the test as she learns ones very important lesson about family: How we nurture is the true nature of love. As one of my first books after jumping onto the adult scene, I am highly satisfied. This book wasn't such a cutesty book I thought it to be. I thought it was going to be a light, fun, adorable read, but it just wasn't that. It had some really dark things about it and a shocking twist, like a mystery novel mixed with a romantic comedy. It held so many characters who were so, so different and the way they were all compiled together was just perfect. Everyone's journey was different, but it pushed the story in a really good direction. The pacing was a bit slow, but I didn't mind it at all. With this being one of my first real chick lit reads, it was great. Full of heartfelt moments as well. Josie Brown really captures what it's like to be a mother really well and what Katie felt, I felt as well. I teared up a bit at some points. I MEAN THIS WAS A GREAT BOOK, GREAT BOOK. Its fun, sweet and now I really want more. Oak Harvest Financial Group is a company that offers financial planning services for everyone. With the help coming from Thomas J. O’Connor, a certified financial planner family when retirement comes. He has over 33 years of experience in the financial service industry with life insurance as his specialty along with its application in terms of financial and estate planning and business solutions. Our certified financial planner in Houston would always design a customized Retirement Defense System for every client. We believe that people from all walks of life would want only want one thing when they retire, that is to have savings to be spent when this time comes.